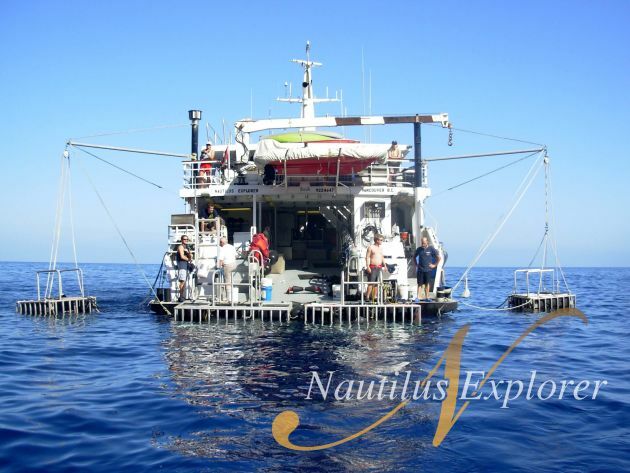 Nautilus Explorer is a ship of 40 meter of length build in 1999. 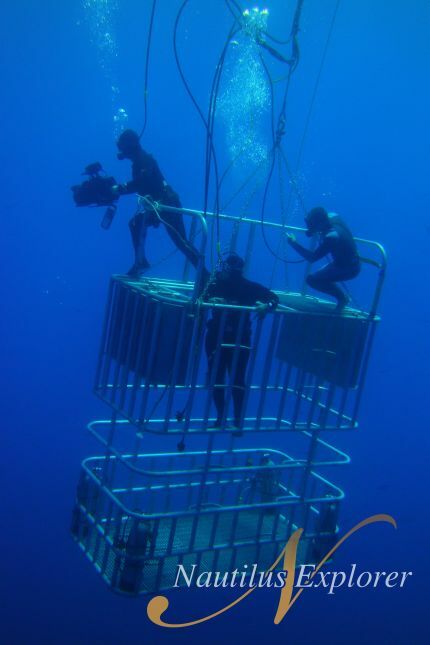 The ship was custom designed with the highest possible level of safety and comfort for divers. The amazing design utilizes every square foot of available space. Nautilus has received the ultimate confirmation of seaworthiness and safety certification: the SOLAS passenger certificate for short international voyages. The Nautilus was carefully designed with a heavy and strong steel construction and extensive soundproofing to be safe and comfortable.The vessel’s bulbous bow, hullform and passive stability system provides for a remarkably easy ride while heavy-duty commercial grade systems ensure that you have a smooth-running voyage. The dive Plataform it’s at water level that provides easy entry into dive skiffs, kayaks and Laser sailboat. The Nautilus Explorer is a Boat Built and Launched in Vancouver, B.C. in 2000» Nautilus is 116 feet long and 27 feet wide (Beam). 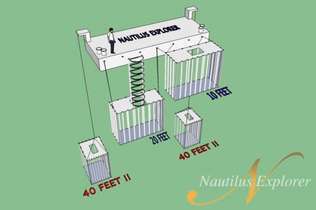 • Steel hull and superstructure for your safety. • Water Capacity: 7000 gallon fresh water capacity and 3600 gallons-per-day water maker allowing you to shower as often as you like. Diving is done via surface supplied “hookah” with backup dive gear in each cage. 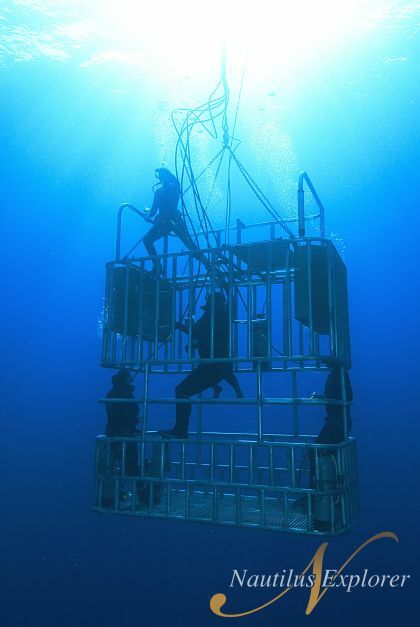 Dive time in the “suspended cage” and “surface cage” is unlimited. 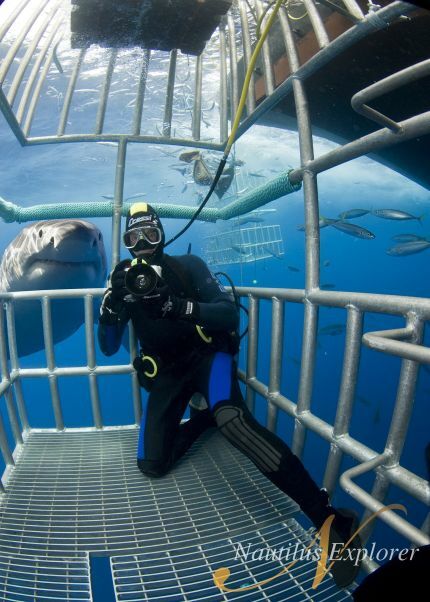 Submersible cage dives are 30 minutes long and if you are a certificated diver, you will have the opportunity to make 3 dives a day The nautilus cages are “double-deckers,” so you can venture onto the upper deck and outside the bars being face-to-face with great white sharks. Nautilus features an imaginative and fresh cuisine with a mix of Mexican and western menu items prepared by the 2 chefs. You can expect a mix of plated, family style and buffet service with lots of varied appetizers and fresh snacks and a barbeque on the upper deck or onshore. Repeaters appreciate the famous Nautilus burgers.There is an amazing variety in alcoholic beverages; 50 wine labels, 12 types of single malt, over 40 different kinds of beer and many other drinks available for purchase at very reasonable cost. 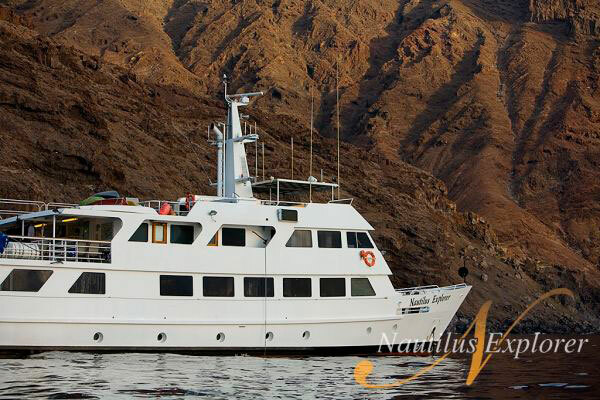 The Nautilus Explorer carries 25 guests in different types of cabins; 1 triple occupancy cabin, 6 shared stateroom cabins (2 people in each), 2 single occupancy cabins, 3 superior suites (slighty larger and additional window, 2 people in each – located in the upperdeck) and a premium suite (with lounge, TV/DVD, 2 people). There are eight standard staterooms located in the lower deck. Each cabin have private heads with separate shower stalls, central air conditioning and measure 90 square feet. Two of the staterooms have large double beds and additional storage area. Six of the staterooms have side by side beds. There is also one triple occupancy stateroom. Premium Suite Premium suite is twice the size of the other suites and is also located on the hot-tub deck and. It has a separate bedroom and lounge each with a large flat screen TV and DVD player, private facilities with a full-size bathtub and shower plus large private windows looking out on an ocean view. Fly-in gateways are San Diego and Los Angeles, California and Tijuana, Mexico. Boarding is in Ensenada, Mexico and you could get there from San Diego, Los Angeles and Tijuana Airport. Nautilus Explorer offers complete round-trip transfers from a hospitality suite at the Ramada Hotel in San Diego, guests need be there and ready to go early in the morning. 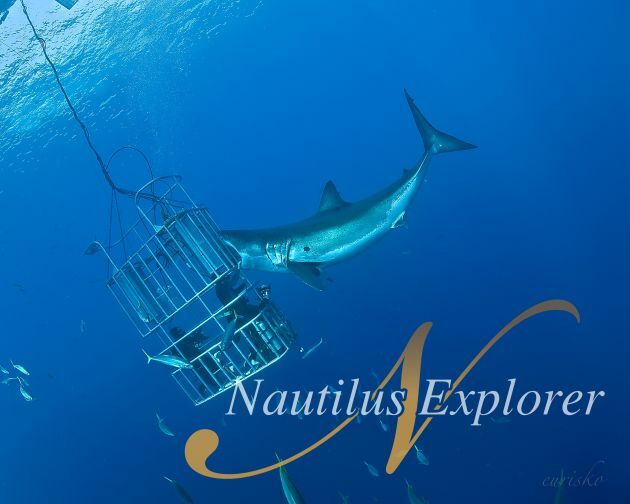 The Nautilus Explorer departs in the evening and takes 20-hour the voyage to get Isla Guadalupe, generally arriving the next day at dinner time allowing for a nice restful night’s sleep before the action begins. 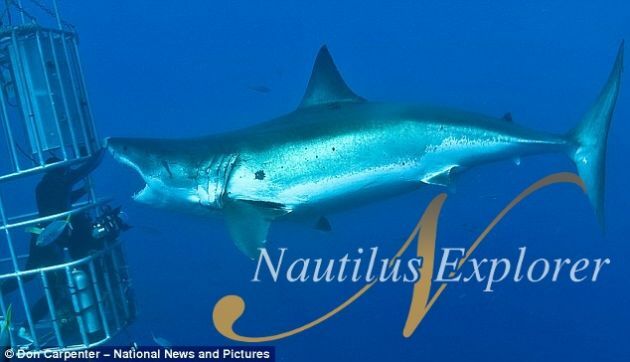 Nautilus generally arrive back in Ensenada port at 2 p.m. on the last day of your trip with included transfers back to San Diego later that afternoon.